Last week I took a little dive into my to-be-blogged archive, paddling around to see what might catch my fancy. Unless I have something particular in mind, I always try to start these searches way back in the older stuff, trying to see what I might have missed/forgotten about. The process – if one can be said to exist – usually involves me bringing home a big pile of records, recording and editing them, and placing them (and a picture of the label) in a big digital pile. I try to stick to a first in/first out pattern, but every once in a while (for a variety of reasons) something jumps to the front of the line. The record you see before you today is not one of those. In fact, I forgot that I had recorded it. 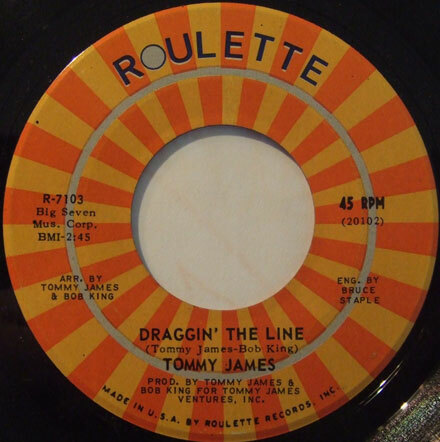 ‘Draggin’ the Line’ by Tommy James was released in 1970, not long after he shed his Shondells, or at least their name. A look at the charts seems to indicate that Tommy’s solo career got off to kind of a weak start. 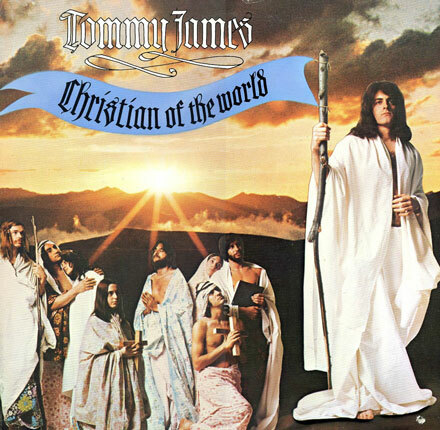 Whether the insane cover of the album ‘Christian of the World’ (James’s second solo album and the record from which this song comes) had anything to do with that, I do not know. However, once ‘Draggin’ the Line’ hit the airwaves, James had a significant hit on his hands (the biggest of his solo career), making it into the Top 5 in 1971. I bring it to you today not because it was a hit, but because it hooked itself into my nine-year-old brain back in the day, and never really let go. This has everything to do with the song’s hypnotic bass line, and the chorus with its call and response of ‘Draggin’ the line’. I’m pretty sure I neither heard, nor understood the lyrics when I was a kid, or I would certainly remembered Tommy talking about his dog Sam (who likes purple flowers) or the explicit reference to tree hugging. The weird thing is that unlike so many other records, ‘Draggin’ the Line’ doesn’t bring up any specific nostalgic memories, other than waiting for it to pop up on the radio so I could hear it again (remember when you had to do that?). Make sure you check out the local survey from one week that summer when the song was hitting in NYC. It’s one of my favorite records from that period when the calendar had turned over into the 70s but the 60s were still hanging on for dear life, and I was spending a lot of time with my ear pressed to the transistor listening to WABC in New York. So that’s the sound for the week. I hpe you dig it, and I’ll see you all next week. 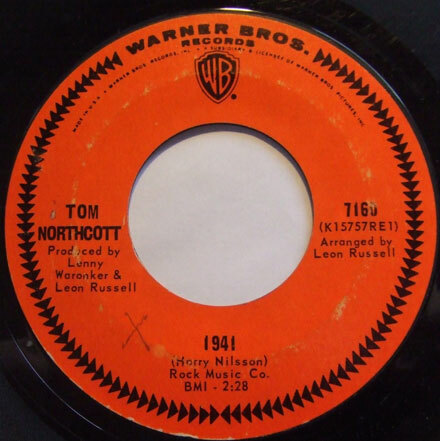 I can’t remember when I first became aware of Tom Northcott, but I am pretty sure that I knew his name for years before I ever heard a note of the music he made. Northcott, who was based in British Columbia, in Canada made all of his records in the relatively short window of 1965 to 1971. 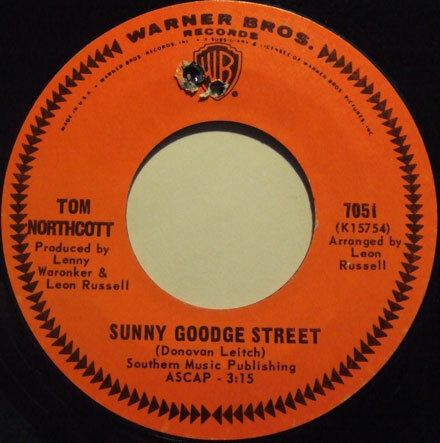 Though he made a few regional records in Canada, Northcott is best remembered these days for a series of 45s he did for Warner Brothers in the mid-to-late 60s and an LP he recorded for UNI in 1971. He had the kind of high, clear tenor voice that was very popular during the folk revival. He recorded a couple of folk rock 45s with the Tom Northcott Trio and the Vancouver Playboys before signing with Warner Brothers in 1967. Northcott recorded a variety of cover and original material, waxing songs by Bob Dylan (‘Girl of the North Country’), Nilsson (‘1941’) and Donovan (‘Sunny Goodge Street’), all of which were Canadian hits in 1967 and 1968. I bring you the latter two tracks today, because of all the Northcott material I’ve managed to find, they are my favorites. 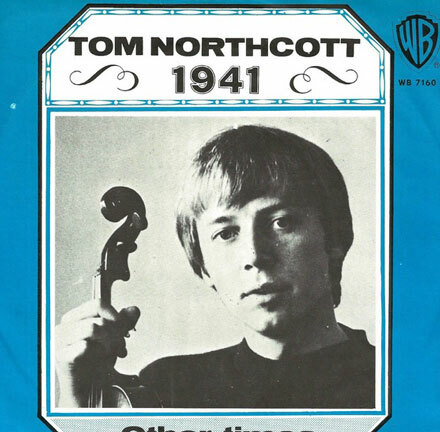 As a certified Nilsson freak, I am constitutionally incapable of passing up a cover version of ‘1941’, and Northcott’s is excellent. Both of these 45s were recorded in Los Angeles, produced by Lenny Waronker and Leon Russell and arranged by Russell as well. Northcott takes ‘1941’ at a much faster pace than any of the other versions I’ve heard (which tend to hew closely to the Nilsson original) and it’s a refreshing change of pace. Though Russell adds in some brass, the arrangement isn’t too busy. His version of Donovan’s ‘Sunny Goodge Street’ is a much more ornate, upbeat take on the song. The original is a quiet, meandering affair with a jazz combo and a bowed bass violin. Northcott’s version is a bright, baroque popsike waltz, with accordion, and what sounds like a cimbalom, producing an almost calliope-like effect. There’s a very cool video of an appearance that Northcott made on the Canadian TV show ‘Where It’s At’ performing ‘Sunny Goodge Street’ and ‘Girl From the North Country’ (hosted by Lulu. No less!). Northcott’s UNI LP is a slightly more rock-oriented project, including covers of Leonard Cohen, Randy Newman and a cool version of the Move’s ‘Blackberry Way’. It tends not to be very expensive and I would highly recommend you pick it up if you dig the tracks I’ve posted today. Rhino Handmade released a comp of Northcott’s Warner Brothers material, but it appears to be long out of print. Interestingly, not long after his 1971 LP, Northcott left the music business to become a commercial fisherman, and later got a law degree, specializing in maritime law. There’s a video on YouTube of a 1988 Canadian TV show with an interview with Northcott (fast forward to around 4:30). This month you get a set of groovers by the Bobby Fuller Four, a look at the sounds of one of my favorite pop groups, the Free Design as well as a set of new arrivals. I hope you dig it all, and if you’re new to the Iron Leg Radio Show, take a dip in the archive. I had planned on bringing you the Everly Brothers (original) version of ‘Bowling Green’ for a while. Fortunately for all of us, whilst I was a-digging through the crates I discovered that I had another, very groovy version of the song already, by none other than Glen Campbell. I should start out by saying that the recent news of Campbell moving in to an assisted living facility due to the progression of Alzheimer’s disease was saddening. 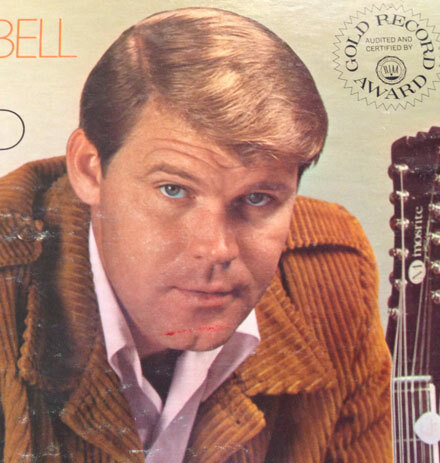 Glen Campbell is one of those artists who had enough mainstream success that the true depth of his talent (and discography) is often overlooked. He was an important part of the famous Wrecking Crew studio outfit, as well as having recorded some very cool albums for Capitol in the 1960s. Though he is often thought of as a country-pop artist, he had excellent taste in covers and recorded many great songs by folks like Harry Nilsson, Donovan, Sonny Curtis, The Bee Gees, Otis Redding, Dorsey Burnett and even Paul Revere and the Raiders. 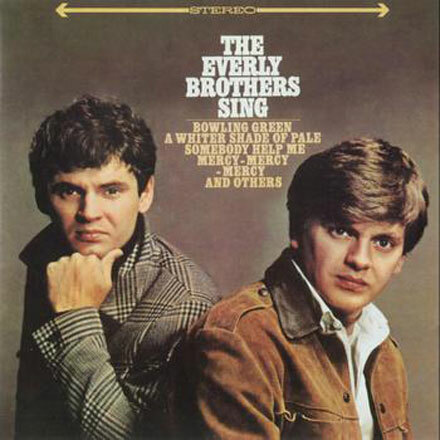 The song I bring you today was first recorded by the Everly Brothers (on their excellent ‘Everly Brothers Sing’ LP) in 1967. 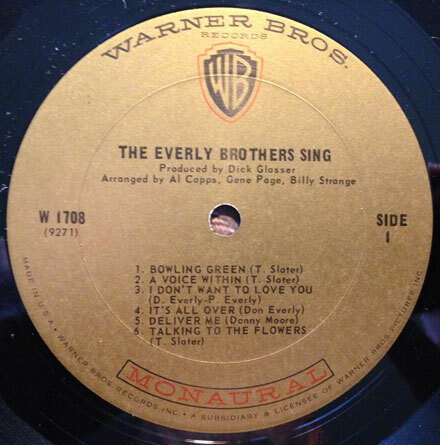 ‘Bowling Green’, written by the Everly’s bassist Terry Slater with Jacqueline Ertel (I don’t know why she’s not credited on either of these labels) was a Top 40 hit for the brothers in the Spring of 1967. 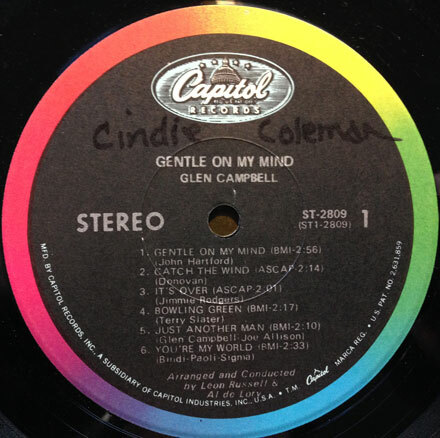 Campbell recorded it later that year on his ‘Gentle On My Mind’ LP. While the Everly’s version features their unmatchable harmonies, Campbell’s take on the song sports a much livelier arrangement by none other than Leon Russell! Interestingly, the song was recorded again, a year later by the Gosdin Brothers, who gave it a slightly more countrified feel. Both versions are excellent, and I would recommend picking up both albums (especially the Everly Brothers LP which has some surprising, even psychedelic touches) if you find them.